Digital and Local Area Marketing Made Easy! Digital marketing doesn’t have to be complicated. Sure, there’s a lot to learn, but when it comes to your specific business and generating a LOT of leads there’s a finite amount for you to learn to be very happy with the results. First, and the most important ingredient of online marketing, is your website. There are websites and there are websites. If you paid for 5 developers to build a website, they would all look completely different, and work completely different. Some wouldn’t keep visitors on your site, while others would, so its safe to say with all marketing, there is effective marketing and ineffective marketing, even with brand-new marketing. The important question is, can you (who’s paying for it), tell the difference between the two and in seconds? Seconds, not minutes is how long it takes to determine an effective, client-pulling website. And not 50 seconds, and not 30 seconds, but about 3 seconds. That’s all it requires. 27 years of testing thousands of variations of just about every form of marketing provides some extraordinary insights. Insights you almost certainly wouldn’t believe if you were told them. Check out our FREE online marketing course for some of those ‘unbelievable’ points about websites and online marketing. Let’s start with the simple topic of your website. Ask your website develop how many months or years they were trained to learn website development. And then ask them how many months or years they were training or paid to learn marketing from the best in the world. See if there’s a difference and which one of the two they have learned and been trained by experts in. Which one do you think it would be? There’s a very high percentage of marketing that hasn’t changed in 50 or 80 years at least and perhaps many hundreds of years. People buy, based on emotions and probably have always, for thousands of years. People are enticed and attracted by promises of benefits. They seek to understand a selfish outcome from what they buy, because they are the ones paying for a beneficial outcome. Does it really matter what the name of the company is that they buy from? Does it benefit the customer to know the business has been trading five or ten years or twenty? The company service provider is simply a means to an end. They supply the (paid for) service and the customer doesn’t have to fall in love with them in the process of buying, nor do they have to even like them, or have anything to do with the company after the service has concluded. Now take your own website. The same principles of marketing apply. Your website is a means to an end. It’s about the outcome for the client because that’s what they’re paying for. They really aren’t interested in knowing all about you, your history, what other services you sell, or anything much except what they are interested in and that’s the outcome you can provide. All customers want to be happy with the outcome of their purchase. That’s as simple as it is. Since that’s the outcome they want, do you think it would be smart to show that outcome, on your website? What would that outcome involve? That’s easy! A photo… of happy people, enjoying the outcome of your service. If you can’t show the outcome because it’s intangible, then show a photo of happy people, the same age and in the same situation as your “Ideal Target Market” customer. This is simple in concept, but oh so extremely relevant and absolutely important! 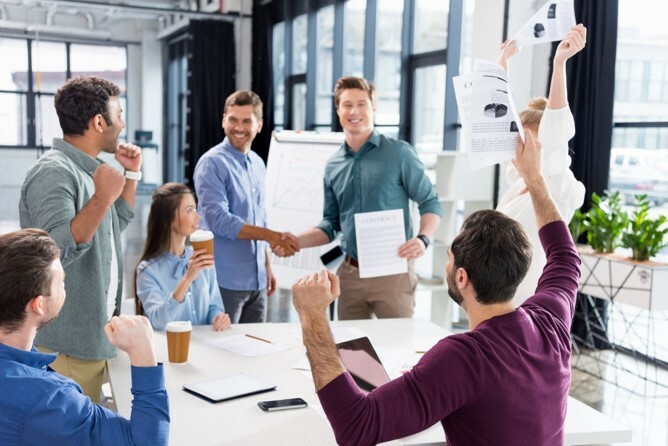 Show happy people, so when prospects visit your website they are met with the happy people photo, and it needs to be shown to them in the very first 1 to 2 seconds, not 10 seconds into their visit. People are extremely judgmental. They “judge” a website (or any image for that matter) in 2 seconds. That’s all it takes. Think about that next time you visit a website, or see any image of people. See how long it takes you to draw a conclusion and make a comment or ‘summary’ of what that image is and what it’s communicating. With a happy photo of people on your homepage, you now need to add some other happy people on other pages. The first image seen in seconds is absolutely critical, but the next most critical ingredient isn’t far off in terms of power and effectiveness. The second most critical ingredient is the first text, which needs to be BIG and bold so people instantly see it with the photo. This first text – called the “Headline” must tell people something interesting, so they immediately feel your website is interesting by arousing their curiousity or just peaking their interest. Notice the website headline on this website on the homepage? It makes you keep reading and that’s the purpose of the headline. It can also deselect anyone as well, which is good because you won’t be talking to people who aren’t your ideal target market. The No.1 local area marketing strategy is to get your business on Google Maps. All you need to do is have your address “verified”, which means search for ‘google my business’, log into Google and then search for Google My Business and set up your account with your address. If you operate from a home office you can hide your address so it’s not seen, but you have to have a physical street address to register for Google Maps through Google My Business. You will be mailed a postcard with a 6 digit number on it that you enter into Google after it arrives. It takes about 4 to 6 weeks for it to arrive. Then you can add phrases relating to your business, and you’ll start to be found on maps, like the image above. You also need to ’embed’ the Google Map on your website (Contact page) as well. 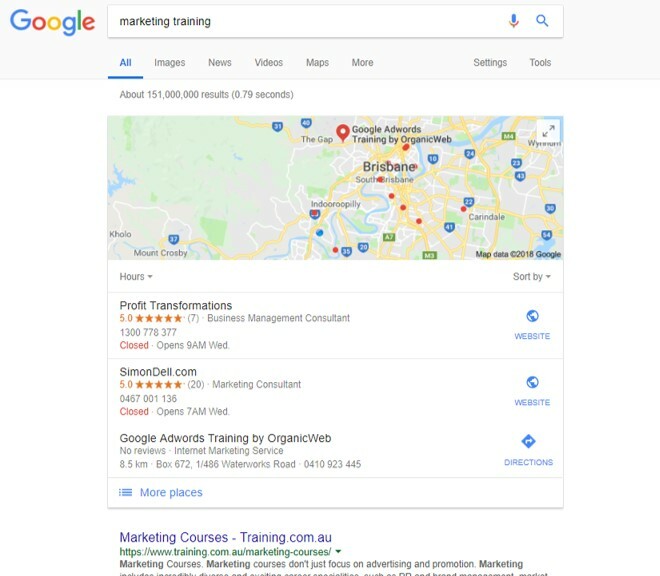 This fantastic strategy is often not used with many local businesses and if you do a search for your industry, take a look at how many competitors show on the map. There’s a LOT more to this strategy that there’s space for here, but if you have competitors you can rise above their entry for the Map with some extra special techniques. Then of course there’s another fantastic strategy called ON-page SEO. ON-page SEO is what you do to your own website to make it far more “Google friendly” – i.e. liked by Google so it ranks better in search results. This article just scratches the surface of what you can do to significantly increase the leads to your website… for FREE with local, digital marketing. To take this a great step forward, so you are totally empowered with local area marketing, check out our digital marketing course – The Marketing Fast Track. This fantastic workshop has content valued at thousands of dollars, because it will literally save you that much if you are into online marketing, or are going to be this next year. There’s 27 years of testing over $100,000,000 worth of marketing, both online and offline behind what’s in all the information of this course. Check it out and if you’d like to know more, register your expression of interest, or send a contact message here, or give the office a call. Business owners pay thousands of dollars ON marketing, yet pay almost nothing to learn marketing. Ignorance is extremely expensive when you have to “hope” your marketing works. Wouldn’t you prefer to be certain? very impressive tips these are very helpful for business development if we follow all of these we definitely success in our business. Thanks for sharing. This post was technically sound. I have collected overall info in one post. Thanks for sharing.